Platform sharpening is a quick and convenient method of sharpening woodturning tools using a grinder or sander with a tilting platform. With the angle set, the tool simply rests on the platform while the grinder does its stuff. The process is extremely simple, and platform sharpening is the best method I know for scrapers, skew chisels and square-ended gouges. Some people hone the tools to refine the edge, but most probably use them straight from the grinder. You can use the platform for other gouges once you have the knack of swinging and twisting the gouge. There are a couple of problems to deal with in platform sharpening. The method often recommended for setting the platform angle is to match it to the existing tool bevel. You can ink the bevel where it touches the wheel for greater precision. I find the sound and feel of the grind when turning the wheel slowly by hand more helpful than the ink. When just the heel or the edge is in contact with the wheel, the sound is harsh and more grating. When the bevel rests properly on the wheel the feel is softer. Either way, copying the existing bevel works well, but is a bit slow, and liable to cumulative error. The platform angle will never be set perfectly. If there is the slightest bias in one direction the bevel angle will gradually change. 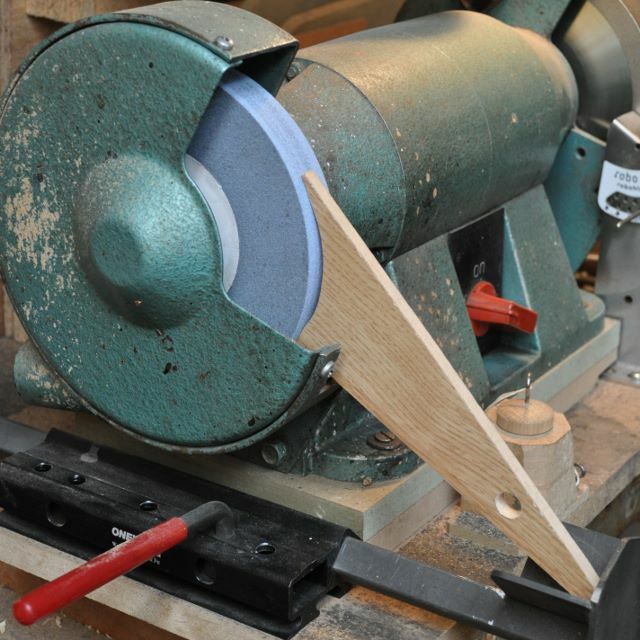 It’s more consistent, and quicker, to use a simple setting jig. The one I described in another post will maintain consistency. If the platform angle is always the same, any one tool placed on it will always be ground the same. The bevel angles may not be the same on different tools. This is because the edge of a thicker tool will be higher on the wheel. The second problem is that long and heavy tools are hard to keep in proper contact with the platform. They are too unwieldy. You need a light touch on the grinding wheel, which is not easy if you are holding the tool firmly in place on the platform, as you must to keep the angle. This means you may need platforms of different sizes. A large one to give stability to large tools, and a small one for short tools, which would have insufficient ‘reach’ to sharpen on a large platform because the handle hits the platform edge. A minor inconvenience is that when platform grinding different tools at the same time, you may have to change the angle. The wheel has to come to a stop before you can do that. I use a ‘Robo Rest’ adjustable platform that I can set without stopping the wheel. A pin in one of the indexed holes locks the platform at any of the provided settings. Because it doesn’t reference from the wheel itself, this method is best when using a CBN wheel. These don’t wear down, but other wheels get smaller with wear. With them, you have to move the platform from time to time. Otherwise the tool angle will change. I found it very quick and easy to set the angle. It does its job well, with a repeatable grind. Its build quality is not as good as I would like. Its top surface is not very flat, and there is significant play in the locked platform. The maker points out that more rigid construction would add to the cost. I find that pulling the platform forward in use takes up the slack. The flatness is adequate. I recently posted (12 October) about my new Alan Lacer skew chisels. I have had more opportunity to use them now and like them more and more. I think the smaller one may be more generally useful for most turners. I’ve been sharpening the edges with a diamond hone and thought today that I should jig the grinder to suit these tools. You could do a lot of honing before grinding is necessary though. The grinding method advocated by Alan Lacer is the one I have always used for my curved edge chisels – set the grinder platform to the correct angle and simply swivel the tool while it is flat on the platform. You can see this on his website or on Youtube. This gives you an even bevel provided you keep an eye on the swivel limits so you don’t over-grind the points. I was therefore interested to note that the grind used by the manufacturer is different. Although they are sold as Lacer signature chisels, the different grind gives them a different bevel and affects their use. I think they must be ground by twisting the blade instead of swiveling it, lifting the long point off the wheel to grind the short point, giving a more rounded bevel and making the short point very obtuse. It took quite a lot of work to bring the grind back to what it ought to be, and I think it could confuse a beginner. Update – I have now changed the signature grind on these tools completely. I made the setting jig for my grinder. Jigs are very important for quick and accurate repeatability. Unfortunately I cannot use the metal platform that came with the grinder as it is not sufficiently adjustable. I am now using the Tormek platform rest. I have made a block to set the extension of the arm, and an angle setting jig to position the platform.